The antenna diagram you see before you is nothing more than two dipoles fed from the same coaxial line. I call it a " DX Dual Dipole" because it is cut for two very useful DXing ham bands. There is no harmonic relationship between 20 and 15 meters, and so they "play" well together when sharing the same transmission line. The wire length cutting chart for HF ham band dipoles is found in any antenna handbook. (The half wave dipole cutting formula is: Length in feet = 468 divided by the Frequency in Mhz.) Both dipoles are cut per the chart (or formula) to the low end of each band, leaving a little extra wire length for SWR tuning. Construct the dual dipole using the techniques described for the NB6Zep Antenna and make the wire spacers from plastic coat hangers as described there. Follow the instructions in the handbooks to make a 1:1 current type balun device using a small toroid core. (The smaller T130 red HF material cores work fine for several hundred watts.) The use of a balun is not strictly necessary for the dual dipole, but it is strongly advised if you are going to add a parasitic element (reflector) as described later. If your feed point is not supported, as was the case for me, you will want to use a strong stranded wire (#20 thru #12 AWG) and light weight coax. The two element yagi style antenna I am most comfortable with is one that employs a reflector instead of a director element. The yagi I chose to build has a parasitic reflector nine feet behind each dipole. (Nine feet was a compromise for dual band operation.) My computer modeling looked good with standard reflector lengths, so I cut the reflector wire lengths to what I found in the antenna handbooks for 2 element yagis. You should have reasonable results if you cut the wires to 5% greater than the dipole length (dipole x 1.05) for each band. When the reflector is in place behind the driven element as shown, you should notice a slight change in the SWR. This is due to mutual inductance as the reflector is inducing power from the driven element. The effect is to lower the impedance of the driven element. If you trimmed the dipole SWR for the low end of the band as previously instructed, you may find the resonance is now in the middle of the band. However, you may need to do some final trimming on both driven elements to compensate and make a better match at the transmitter side of the coax. When you are satisfied with the SWR on both bands, raise your yagi as high as possible and free from large objects and other tuned antennas. I have my dual yagi at 30 feet above the back yard and pointed at 33 degrees towards Western Europe from Beaverton, Oregon. A major challenge was to figure a way to support the yagi in the direction I wanted it to operate. I used two trees supporting an existing 15 meter EDZep wire and used a third tree to triangulate enough nylon twine to create the configuration shown. My Dual Band Yagi has been in place, with zero maintenance needed, for over two years... A closer view shows more detail of the wire spacers, (note the NB6Zep at 40 feet). Basic Performance: The antenna modeling was done with all the wires in the yard included in the model to get the whole story of how well this antenna should do for me. First on 20 meters... CLICK for DETAIL . Slightly better results is predicted for 15 meters... CLICK for DETAIL . Needless to say, after seeing these predictions, I was excited about building and testing this antenna! Comparison testing has shown that the gain from the yagi is close to what the model predicted. Granted, it is impossible to measure a 3.6 dB gain while operating under skip conditions, but the yagi out performed all wires I tested it against. The Front to Back ratio is a bit hard to confirm from Oregon; but I note that my 15 meter EDZep used on 20 meters always works better to the South Pacific than does the yagi. The differences between the yagi and the NB6Zep (SE and NW) on 20 meters is typically greater than 20 dB for skip conditions. The beam width is noticeably broader on the yagi than on the NB6Zep and I can use it for contacts to the NE sections of the USA. With the yagi antenna I am able to work any European station I hear on 20/15 meter CW, MFSK16 or Hellschreiber mode with 50 watts. I can hear good PSK31 sigs from over the pole, but still have a hard time decoding them here in the North West. Would you rather use a tuner instead of manually trimming each dipole? 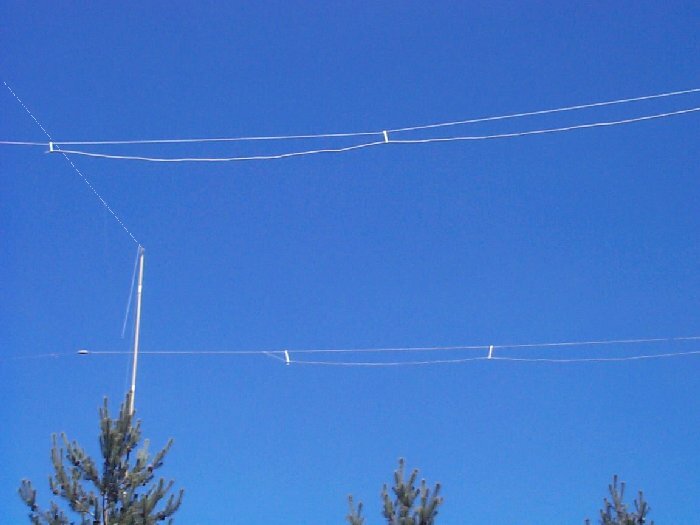 The Super Zep antenna is a more "elegant" solution for a multi-band wire beam.